Few weeks ago I mentioned the VirtualBox SOA Suite and BPM 11g R1 PS2 Appliance. In the last week we’ve been test driving it on several machines. We noticed that on some 32-bits Windows7 machines the WebLogic Server and SOA Suite fail to start. The reason seems to be that on some 32-bit Windows 7 machines the amount of memory that can be allocated to the VirtualMachine in VirtualBox is limited to 1500 MB. The Base Memory sets the amount of RAM that is allocated and given to the VM when it is running. The specified amount of memory will be requested from the host operating system, so it must be available or made available as free memory on the host when attempting to start the VM and will not be available to the host while the VM is running. This is the same setting that was specified in the “New Virtual Machine” wizard. These are set in the wls_env.sh which can be found in the /home/oracle/bin/. Altering the -Xmx to a lower value (lower than the amount you can allocate on your workstation) can solve this problem. Since I’ve been involved in several projects in the last year that want to use both SOA Suite and the Oracle Service Bus (which at least from some perspectives is part of the SOA Suite) it was a bit disappointing for me that OSB isn’t included. I’ve been asking around for the rationale behind this choice without any satisfying answers so far. Please leave your thoughts in the comments or in this thread of the Oracle forums. This entry was posted in JDeveloper, Oracle, SOA Suite, WLS and tagged 11g, BPM, JDeveloper, Oracle, SOA Suite, VirtualBox, WLS on 2010/11/09 by PeterPaul. The download and setup instructions can be found on Oracle Technet. This entry was posted in BPEL, Oracle, SOA Suite, WLS and tagged 11g, AMI, BPM, EC2, Fusion Middleware, Integration, Oracle, Release, SOA Suite, WLS on 2010/09/14 by PeterPaul. This entry was posted in AIA, Oracle, SOA Suite and tagged AIA, BPM, Fusion Middleware, governance, Oracle, SOA Suite, WebLogic, WLS on 2010/09/14 by PeterPaul. Although I didn’t attend the Burton Group Catalyst Conference in Prague this week, I was able to get a glimpse using twitter and some blogs. My main focus was on the Life after SOA: Next Generation Application Architecture track. In this post I’ll share some quotes and thoughts with you. If you can’t manage and govern your services with a wiki, a registry/repository won’t help you, either. This goes great with the statement that I’ve put on this blog before that it is not about the tool it is about people and process. Besides that managing a Service Repository also isn’t a Silver Bullet either, it has proven to be very useful for some of our customers. Too much focus on business process automation is detrimental to your BPM initiative. Automation helps reduce human effort, but fixating on automation gets in the way of optimizing the business. Automation can be an enabler for optimization, however it should never get in it’s way of become some kind of burden. Yes software can help, but software is a means to (process) optimization not an end or a goal. BPM infrastructure tools: process modeling tool is key. But models are not to be created to generate code. On one side I’ve worked with tools that generate good code from models. At the same time I’ve worked with analyst and other functional people that do not have the skills to create a model that will result in great software. Please share your thoughts on the subject in the comments! This entry was posted in Architecture, Service Orientation and tagged Architecture, BPM, Burton, Fusion Middleware, governance, Service Orientation on 2010/06/24 by PeterPaul. In the blogpost on the release of SOA Suite 11gR1 PS2, I mentioned a link to the documentation index. Since it hasn’t been update by now, I suggest you go to the middleware documentation page. This page is more up to date and has the link to the web library and download address (Alert! approx. 860 MB) of E14571-01 – the Fusion Middleware Online Documentation Library 11g Release 1 (11.1.1.3.0). This week it was announced that BPM 11g R1 is available as an Amazon Machine Image (AMI). This AMI includes SOA Suite 11gR1 Patchset 2 and JDeveloper with the SOA and BPM extension. In AWS filter on 64-bit and put soa-bpm in the search box. This should enable you to find oracle-soa-bpm-11gr1-ps2-4.1-pub. Some of the tips I posted on x SOA Suite in the cloud could be useful here as well. This entry was posted in BPEL, JDeveloper, Oracle, Service Bus, SOA Suite, WLS and tagged 11g, AWS, BPM, EC2, Fusion Middleware, Install, JDeveloper, Oracle, SOA Suite, WebLogic, WLS on 2010/06/17 by PeterPaul. On October 5 and 6 2010 the worlds largest SOA and Cloud Computing event will be held in Berlin; the SOA Symposium. The International SOA and Cloud Symposium brings together lessons learned and emerging topics from SOA and Cloud projects, practitioners and experts. The SOA and Cloud Symposium 2010 program committees invite submissions on all topics related to SOA and Cloud, including but not limited to those listed in the preceding track descriptions. While contributions from consultants and vendors are appreciated, product demonstrations or vendor showcases will not be accepted. My blogpost of the SOA Symposium 2009. This entry was posted in Architecture, Patterns, Service Orientation and tagged Architecture, BPM, Erl, Patterns, Service, Service Orientation, SOA, SOASymposium on 2010/06/08 by PeterPaul. To work with the Oracle Business Process Analysis Suite 11g (BPA) as a team, you need a central repository. This post will give you a quick insight in the installation steps of the Oracle Business Process Repository, as the repository for the BPA Suite is called. The complete installation and administration guide can be found here (as PDF). Turn to paragraph 2.4 if you’re installing on Windows of 2.5 if your installing on Unix/Linux. Create a database with the AL32UTF8 character set. Create two tablespaces ARISDATA and ARISINDEX using automatic, unlimited growth. Make sure there is a temporary tablespace called TEMP or alter the SET DL_TS_TEMP=TEMP. If you choose other names alter the SET DL_TS_DATA=ARISDATA and SET DL_TS_INDEX=ARISINDEX in the envset.bat or envset.sh. The envset file can be found in the \Setups\DBMS\Oracle of the V17759-01_2of2 DVD. Run the envset.bat (or .sh) and install.bat (or .sh) from the \Setups\DBMS\Oracle directory of the V17759-01_2of2 DVD. Choose to run as a Windows service of you’re on MS Windows. Download Oracle Business Process Analysis Suite 11g. Look into the certification matrix (XLS). Download the samples and the guide that comes with it. This entry was posted in BPA, BPEL, Oracle, SOA Suite and tagged 11g, BPA, BPM, Fusion Middleware, governance, Oracle, SOA Suite on 2010/06/03 by PeterPaul. Few days ago a colleague published an interesting blogpost on jBPM, JPA, and Hibernate. The post was noticed by Tom Baeyens, who until late March 2010 was the project lead for jBPM at JBoss. This entry was posted in Architecture, Open Source, Service Orientation and tagged BPM, Hibernate, Java, jBPM, JPA, Open Source, Patterns, SOA on 2010/04/01 by PeterPaul. Few days ago Gartner published it’s Magic Quadrant for Business Process Analysis tools. ARIS is one of the most comprehensive enterprise and BP architecture toolsets on the market, with strong support for a wide variety of standards, methods and frameworks. IDS Scheer OEMed ARIS to both SAP and Oracle. Oracle and SAP use ARIS as the EA and BPA modeling tool. This will probably be continued even now that Software AG has acquired IDS Scheer. This acquisition can introduce a period of organization and product integration. Gartner suggests that customers monitor the situation. Earlier IDS Scheer has released ARIS Express, as free BPM software product to the market. Gartner sees the Express product as a lightweight BPA product for low maturity or occasional use. It can be used for commercial use and has an upgrade path to ARIS professional products. A great product for anyone starting on the BPM track. This entry was posted in BPA, Oracle and tagged ARIS, BPA, BPM, Gartner, IDS Scheer on 2010/02/24 by PeterPaul. Only two years after acquiring webMethods, Software AG has announced it wants to acquire IDS Scheer. 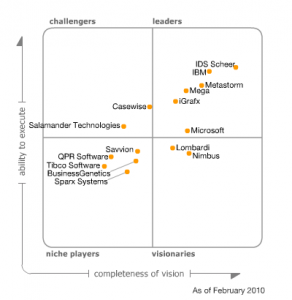 IDS Scheer has a great name in the BPM as well as the Enterprise Architecture (EA) market. Their strong global brand will enabled Software AG to grow it’s name in these markets. Oracle has based it’s BPA Suite on the ARIS Design platform. From now on Oracle has to rely on a competitor to augment the process modeling capability functionality of their suite of products in the BPM arena. This puts the Oracle BPM 11g and BPA Suite 11g Partner Community Launch in a slightly different perspective. One of the most insightful blog posts on this subject so far comes from Forrester. This, like other sources, states that “Software AG has agreed to treat ARIS as a separate entity, with its own roadmap and strategic direction“. Actually good news for ARIS customers, and continuity of the ARIS Design platform. This entry was posted in BPA, Release and tagged BPA, BPM, Release on 2009/07/16 by PeterPaul.